Having nursed a long and healthy obsession with rabbits, Easter holds a very special place in my heart. I’m almost equally passionate about chocolate, which may also help. But Easter is particularly special for me now, having my first book out about a little bunny. So Squish and I would both like to wish you all a very happy and hoppy Easter. 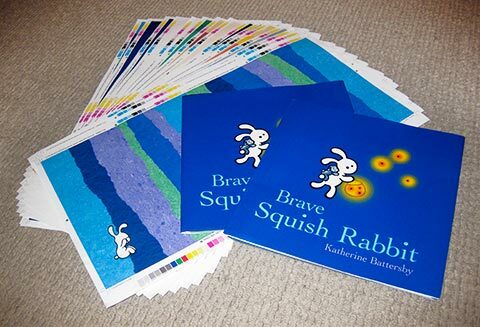 The print proofs for Brave Squish Rabbit, plus two galleys (unbound mock-ups). I am thrilled to bits with how it’s turned out! So much so that I’m even willing to use exclamation marks!! Considering the first book is all about white space, I made it quite hard for myself by setting book two at night. It meant I had to develop a more complex colour palette, working hard to create space and balance. I love how it’s come up on paper – seeing Squish swimming in all those colours. I might give you a few more sneaky peeks at the interiors as the publishing date of September approaches. Ever since I was a little girl I was aware of the round stickers that occasionally popped up on Australian book covers. I didn’t know what they said or exactly what they meant, but I knew one thing: whether the sticker was silver, bronze or blue, the book was going to be good. As I got taller and older I learnt about the Children’s Book Council of Australia, the organisation behind the stickers, and that each year they ran awards to select the best Australian children’s books published. Over a lifetime these stickers have informed much of my reading. As a wee one I was much more likely to pick up a book if it had one on the cover. As a teenager so many of the books I treasured were awarded (Gary Crew’s Angel’s Gate, Isobelle Carmody’s The Gathering and Melina Marchetta’s Looking for Alibrandi). As an aspiring author / illustrator, my reading list came directly from the award notable list (although I had often read most of them already). Then, as I became part of the writing community, each year I’d barrack for my friend’s book and my favourite picks. This year the awards meant something different. I had my first children’s book ‘out there’. I was determined not to think about the awards, but a friend mentioned when the short-lists were announced and I suddenly found myself thinking (and stressing) about them a whole lot. It was kind of awful. Steven Herrick wrote a beautifully humble and honest post about how writers try to pretend that awards don’t matter – that we don’t mind whether we’re selected or not. I even tried to trick myself into thinking this, with lots of very sensible self-talk about the fact that it was only ‘my first book’ and that ‘so many amazing books are published each year’ blah blah etc, but it didn’t really work. 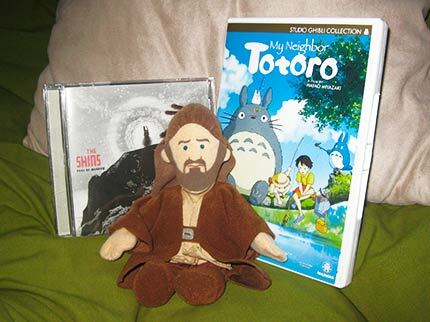 I still harboured a deep secret hope. Tuesday was the fateful day, and after all that stressing I still feel incredibly humbled and overawed with the news. Squish Rabbit was selected as part of the short-list for the 2012 Crichton Award, which aims to encourage new talent in the field of children’s illustration. It was also selected as a Notable Book in the Early Childhood Category of the Book of the Year Awards, which I’m thrilled about. The Australian writing community is such a supportive one, and there was an outpouring of lovely congratulations and kind words – thank you. So many amazing books made this year’s lists, including those by some of my favourite people: Michael Gerard Bauer, Lucia Masciullo, Peter Carnavas, James Foley, Prue Mason, Sally Rippin and Wendy Orr. So proud to count these incredible writers and illustrators as friends.